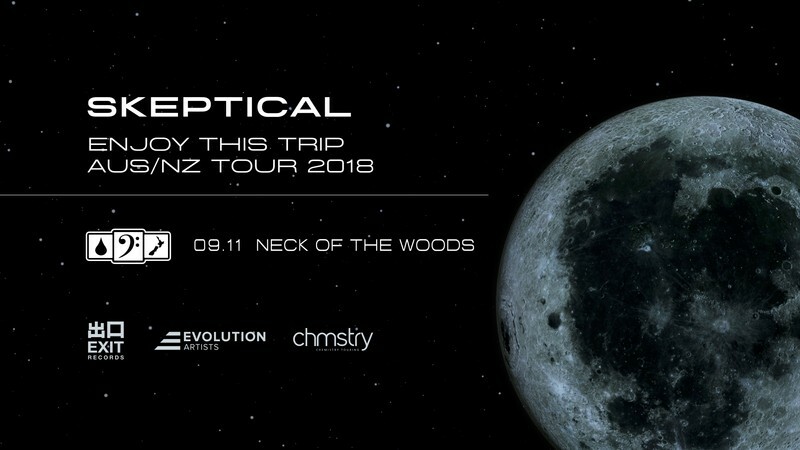 DropBassNZ - Skeptical (UK) - "Enjoy This Trip" Album Tour. Since the outstanding Blue Eyes EP on Ingredients Records in 2011 Skeptical has since had a slew of impeccable releases on highly esteemed imprints such as Dispatch, Metalheadz, Soul:r and Exit Records. Exit Records became the home for 'Marka', a collaboration with Dub Phizix and Strategy which went on to being a DJ's pick for many dance floors worldwide while racking millions of views on YouTube. Skeptical's releases schedule with Exit has been thick and strong with releases such as Imperial EP, Outset EP and Without A Trace EP with Alix Perez in 2017. Not shy of collaborating Skeptical is 1/5 of collective group 'Module Eight' made up of producers dBridge, Kid Drama, Loxy and Resound. Module Eight is a project of like minded producers with an aim to have fun writing experimental music, it has resulted in an album being released called 'Legacy'. His collaboration track 'Move Way' with dBridge was released on the legendary R&S Records and was the first drum and bass track to come out on the record label since the year 2000. His work with various labels across the globe has seen him remix tracks from a wide range of producers such as Jubei, Jamaican reggae artist Sizzla and more recently Zed Bias. In 2017 he was voted 'Best Alternative Artist' at the Drum & Bass Awards UK. Skeptical who is known for his technical Djing abilities has meant he's travelled the world to places such as Europe, America, South America, Canada, New Zealand, Australia and Asia, his DJ sets have been heard in some of the most popular clubs and festivals worldwide.